It helps when an investor with a large stake in your company helps nominate the person that will regulate your business. 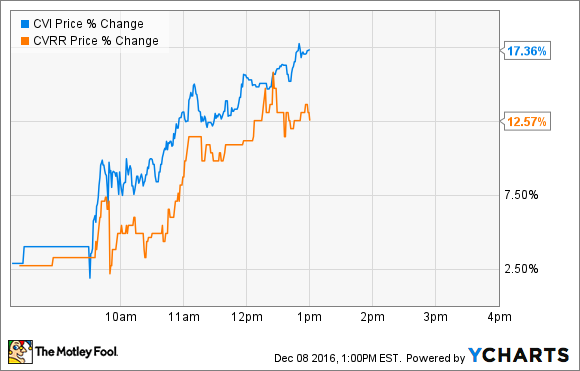 Shares of CVR Energy (NYSE:CVI) and its refining subsidiary CVR Refining (NYSE:CVRR) are both up double digits Thursday as of 1 p.m. EST. The largest reason for Thursday's jump has to do with the announcement that Oklahoma Attorney General Scott Pruitt will head the U.S. Environmental Protection Agency under the President-elect Donald Trump administration. The nomination of Pruitt was already likely going to be a boost for the oil and gas industry in general. Pruitt's work as Attorney General in Oklahoma is well documented with legal suits against the U.S. EPA for numerous reasons. There is a small wrinkle as to why CVR Energy and CVR Refining stand out among the crowd. The largest shareholder of CVR Energy is activist investor Carl Icahn, who, through Icahn Enterprises, owns 82% of shares outstanding. It also just so happens that Icahn was very influential in the nomination of the next U.S. EPA administrator as he actually interviewed several of the candidates and gave his feedback to President-elect Trump. As you can imagine, Wall Street is going to act very favorably when the person with a controlling stake in your company gets to play a large role in naming the person that will regulate your business. Wall Street is probably going to use this news to make a quick buck, and it's entirely possible that the thing CVR has been asking for -- reform of the U.S. EPA's renewable fuels standard -- could take place now that a person who has Icahn's blessing is in charge of the program. For longer term investors, though, there are definitely other things to consider. One is that refining margins have been quite low lately, and rising oil prices are likely going to keep refining margins low for a while. So CVR Refining's -- and, by default, CVR Energy's -- results will likely suffer. There is also the fact that CVR Energy's dividend is paid via cash distributions from CVR Refining and CVR Energy's other subsidiary, CVR Partners (NYSE:UAN). The current cash distributions paid to the parent company aren't enough to support its current dividend, so it's very possible it will need to cut that dividend soon. Regardless, if Pruitt is the head of the EPA or not, these things will have a much larger influence on the company's stock in the future.